Take a look at these jazzy timepieces. 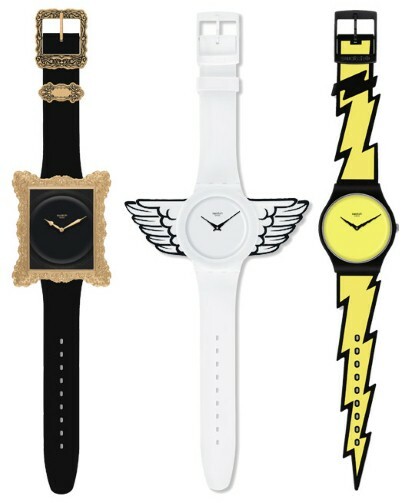 American fashion designer Jeremy Scott, who has previously collaborated with Adidas, has released a range of cartoon inspired watches for Swiss brand Swatch. Known for his pop art designs and use of comic book images, Jeremy has remained true to his signature style with the 1980’s inspired watches. The collection consists of three watches, the first named Opulence, which is a sleek black watch with a gold baroque frame that clips on and off. The second is understandably named Lightning Flash, which requires no explanation, and the last is named Winged Swatch, which plays on the expression ‘time flies’. See what he did there? The watches are in store now and priced at £42.50.